With gun drilling capabilities that allow us to drill deep, round holes with extremely close tolerance diameters, Midwest Precision Manufacturing caters to the needs of the tool & die industry. 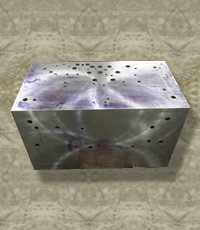 The die set highlighted here consisted of a 3-ton block of H-13 tool steel with dimensions of 22” in length x 20” in width x 37” in height. Specifications called for numerous holes with multiple diameters on each side, as well as a number of cross holes and intersecting holes. Our high capacity lifting systems enabled us to easily maneuver the workpiece for fixturing. Thoughtful cutting tool selection combined with continual precision adjustments to drilling speeds allowed us to create deep, straight holes with a 125 Ra finish while upholding tolerances of ± 0.003”. We measured and inspected the workpieces to confirm we met the high quality standards demanded by tool and die makers. Completed within a one week timeframe, we arranged for delivery to the customer in the Wisconsin area. To learn more about this project or our gun drilling capabilities, contact us today.